- Jathedar Bhai Ranjit Singh Ji, Shaheed Bhai Kabul Singh and the latest three Shaheeds of the Dera Sirsa Morcha. AMRITSAR SAHIB - To voice their anger against activities of the pseudo cults including Nirankaris, DJJS, Sirsa Dera for undermining Sikh beliefs and the concept of Shabad Guru, the Dal Khalsa along with other Sikh religious bodies undertook a ‘Khalsa March’ to "expose the evil and nefarious designs" of the pseudo-saints and also to awaken the masses on the issue. The occasion was 31st anniversary of the bloody incident when 13 Sikhs led by Akand Kirtani Jatha leader Bhai Fauja Singh fell to the bullets of Nirankaris while they are protesting against latter’s blasphemous act in Amritsar on the same day. The Sikh bodies through a resolution steadfastly maintained that any disrespect to Guru Granth Sahib or any challenge to its guruship will not be tolerated and will be dealt firmly with full force. Significantly, the march was flagged off by Akal Takht Jathedar Gaini Gurbachan Singh who also performed ardas. Paying tributes to 13 Sikhs the gathering described them as martyrs of faith. 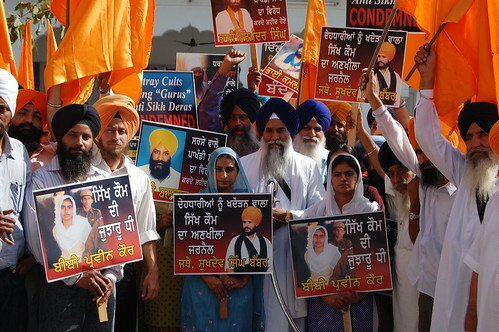 Hundreds of Dal Khalsa activists were carrying placards and large size banners displaying pictures of militant leaders including Sant Jarnail Singh Bhindrawale, Sukhdev Singh Babbar, Talwinder Singh Babbar, Wadhawa Singh Babbar and many others. The spirited gathering shouted slogans in their favour for spearheading the militant struggle against “gurudom” and to avenge the killings of 13 Sikhs against neo-Nirankaris in early 80’s. They also eulogized the role and contribution of former Jathedar Akal Takht Bhai Ranjit Singh who along with Bhai Kabul Singh brought to justice the criminal Nirankari chief responsible for Baisakhi massacre. Large size pictures of Sant Bhindrawale, Sukhdev Singh Babbar, Bhai Ranjit Singh beside those of 13 Sikhs were displayed on the mini-truck. 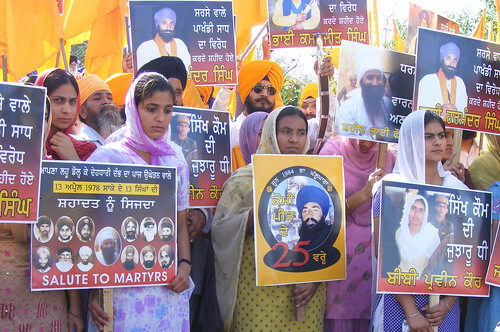 Placards with pictures of 3 Sikhs killed by Sirsa Dera and Bibi Parveen Kaur presently under detention were also part of the parade. A large number of young boys and girls led by Ranbir Singh, president of recently formed ‘Sikh Youth of Punjab’ were carrying flags and placards on which provocative messages were depicted. The congregation saw galaxy of religious and political leaders that converged at gurdwara built in memory of 13 Sikhs to honour their family members with dastars and shields (mementos). The Parade passing through various lanes and streets of the city rededicated that none but the Granth is the perpetual Guru of the Sikh people. 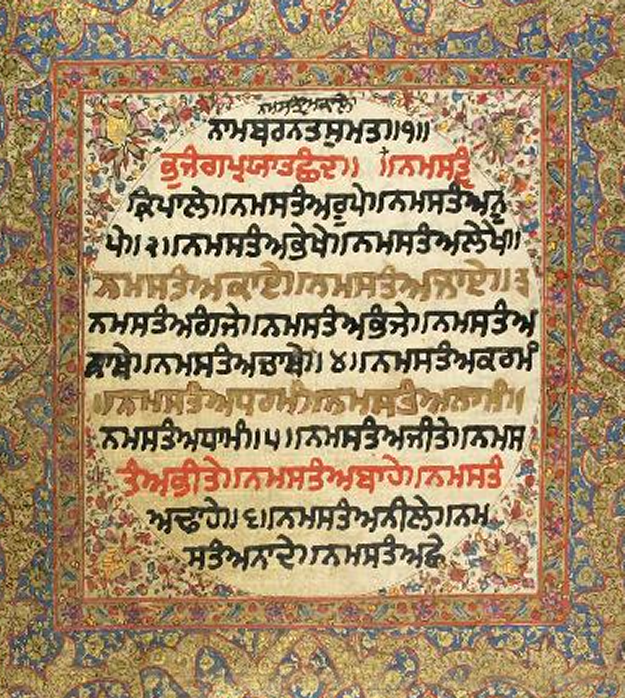 To ensure unflinching respect for Guru Granth Sahib, the Sikh bodies including Damdami Taksal, Akand Kirtani Jatha, Khalsa Action Committee beside Dal Khalsa reiterated that it was a religious and pious duty of every Sikh to defeat the designs of all such sects and cults, which were propagating the concept of "living gurus" contrary to the fundamentals of the Sikh faith. Striking a discordant chord, the organizers said while the Sikhs are presently engaged in a bitter struggle against the blasphemous acts of the neo-Nirankaris, DJJS led by Aushotosh, Sauda dera, they are emphatically opposed to all schismatic sects including Radhaswami and Namdhari sects as they were also underscoring the fundamentals of Sikh religion in a silent but systematic manner. The gathering observed that the anti-Sikh network of likes of Gurmeet Ram Rahim and Aushotosh would have to be curtailed and smashed to uphold the fundamentals of Sikhism. The gathering sought a complete ban on Sirsa dera, DJJS, and complicity of those police and civil officers supporting these cults to be scrutinized. While addressing the spirited gathering, Harcharnjit Singh president of the Dal Khalsa said the continuing logistic support and patronization of the Dera and its pseudo-saint by the Congress Party has caused pain and anguish to the devout in Punjab. He said the edict issued against Nirankaris (10 June 1978), DJJS and Sirsa Dera (17 May 2007) from the Akal Takht was relevant and we expect from SAD that it will respect it in letter and spirit even during election period. We want to live in cordial atmosphere but the biggest obstacle is state’s malafide intention and divisive policies towards Sikhs, said KAC convenor Bhai Mohkam Singh. Our genuine grievances and grudges have never been addressed rather allowed to linger to reap electoral benefits by all successive governments. Damdami Taksal head Baba Harnam Singh said that Sikhs have been passing through a critical phase in the recent times. The challenges before the community are multi-dimensional. He made a proverbial call to empower (politically and socially) younger generation to save them from falling into the trap of social evils like apostasy and drug menace. Tracing its roots to the Baisakhi incident, party spokesperson Kanwar Pal Singh said many radical organizations including Babbar Khalsa, Dal Khalsa, Akal Federation came into being with avowed aim to curtail the blasphemous acts of the pseudo-sects. Former jathedar of Akal Takht Bhai Jasbir Singh Rode, former president of Dal Khalsa Satnam Singh Paonta Sahib, general secretary Dr Manjinder Singh, Bibi Paramjit Kaur Khalra, Jasbir Singh Padhri, Narien Singh of Akal Federation, activists of All India Sikh students Federation, Khalra Mission were amongst the participants.